To me, hard copies of paper like books, magazines and newspapers remain alluring even though everything has almost turned digital. I’ve tried picking up an iPad, mobile, and even a kindle to read, but I still find myself going back to savoring each physical page like it’s an indulgent snack. With the launch of Apple News+, it promises an “immersive magazine and news reading experience” with a comprehensive digital newsstand of up to 300 publications on your devices. It’s definitely great to have an all in one app for that. But I still feel somehow wedded to print. I feel sentimental about flicking through pages. I get more excited when I purchase a fresh and crisp new publication or even wait to get a hold of one via courier, than simply downloading it instantly online. So I don’t know how it’s going to affect my readership in general. There’s just something about curling up with a book or magazine in hand and losing yourself between its pages. I continue to have the urge to visit a bookstore or the library to get a physical copy even though I know it’s available digitally. It’s as though the physical version holds more value. I also get enthusiastic when I hear about a new print publication. This reminds me that a few days ago, Buzzfeed, the online media company for news and entertainment, launched a limited edition newspaper of their content for distribution in New York. They called the stunt as “printing out the internet”. It almost seems that we had gotten so used to consuming the internet and the electronic side of things, that having a print version of anything is gradually becoming unusual. Who knows, maybe print will indeed make a comeback someday. 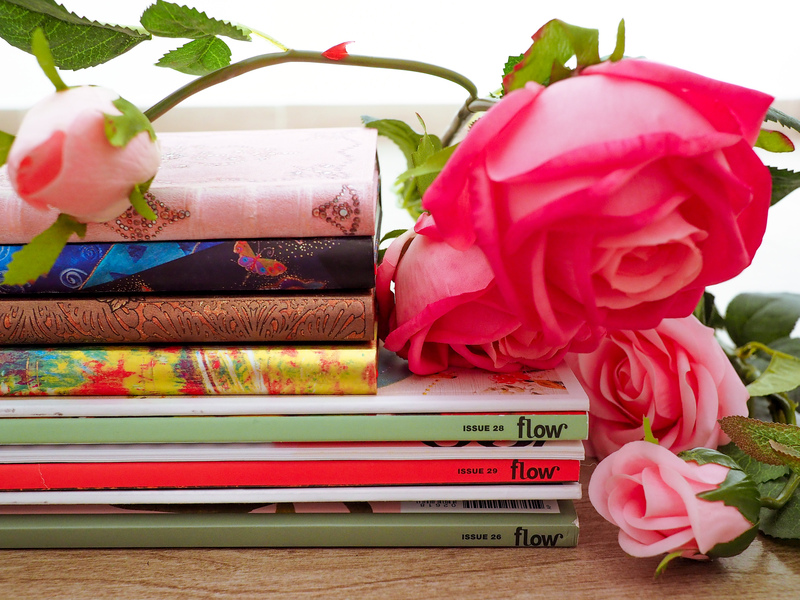 I decided to allocate a post on my current favorite magazine called FLOW because it reminds me of how publications can still be charming in their original form. It all started when I was seeking good, print content. I came cross this quarterly magazine from the Netherlands and thought it was interesting. So, I started an annual subscription with them. This magazine is essentially called a “Magazine for paper lovers” and is filled with artistic inspiration, interviews, and thought-provoking articles on mindful living and positive psychology. Each page is a delight to turn over and meant to nourish your creativity and help you stay connected to the world around us. With each issue, also come postcards, art illustrations, and calendars that you can carefully tear out and collect. You just don’t know what to expect when you turn the page over! It offers plenty of food for thought. I think exploring such independent, foreign indie magazines is also what makes print fun. It’s what they call, the work of “slow journalism”, which are publications that simply take their time on quality. That is why Flow Magazine is a quarterly one. It’s not one of those magazines that you toss out after the issue becomes outdated, because it’s usually filled with rigorously edited long form stories and original photography, illustrations and graphics. Slow Journalism is my new favorite journalistic term now. It’s all about about taking the time to report information with close attention and more depth. I enjoy how, when I open the pages, time slows down in a fast-paced contemporary news world such as ours.